Reading ingredient labels is time consuming and confusing. 1. Read the first 5 ingredients. You should see protein as your first ingredient. The sourcing of such protein is important. The first ingredient on any label is what primarily makes up the food. As the list progresses, the ingredients decrease in amount. 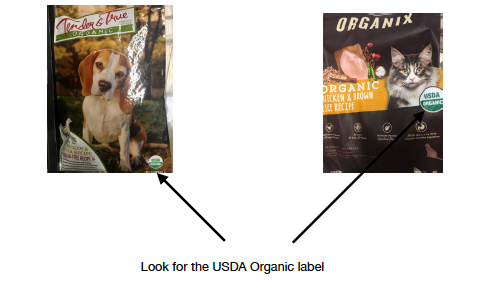 Here you have a pet food both non-GMO verified and USDA Organic! The BEST CHOICE! 3. 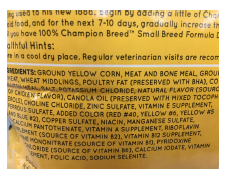 Notice the first ingredient – GROUND YELLOW CORN. 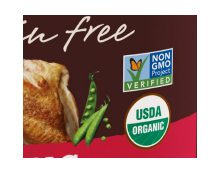 This is not a healthy first ingredient and the packaging did not carry the non-GMO label. Most corn is GMO.